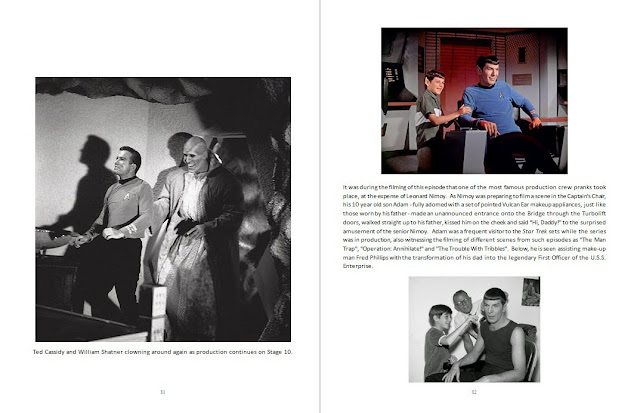 The Star Trek Prop, Costume & Auction Blog: "To Boldly Go - Rare Photos from the TOS Soundstage: Season One"
"To Boldly Go - Rare Photos from the TOS Soundstage: Season One"
I am very pleased to announce my first endeavor as an author with the release of this 218 page, full-color interior, softcover volume entitled "To Boldly Go - Rare Photos from the TOS Soundstage: Season One", which is now available for purchase! 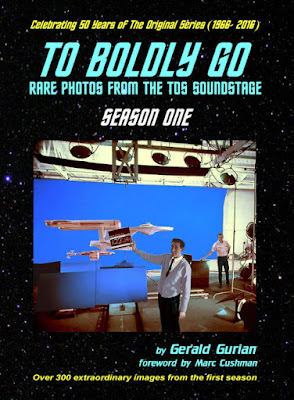 "To Boldly Go" presents not only many of the most exciting images from the Cushman TOS Season One book - most of which are now seen in color - but also a wealth of additional rare photos not included in the "These Are The Voyages" series. 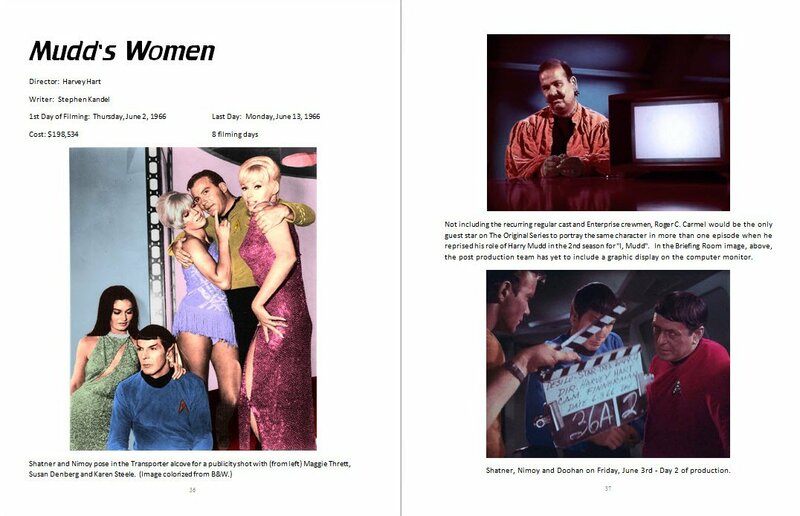 I have personally digitally restored all of the rare photos that appear in this edition, and I paid special attention to the goal of recreating the bold and vivid colors that were present in the original broadcasts of the episodes. Since early 2013, I estimate that I've devoted between 2,000 and 3,000 hours to this activity. 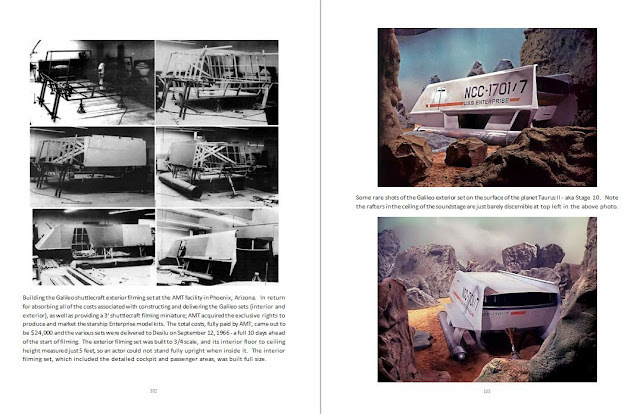 It was first necessary to perform what was sometimes extensive repair work on many of the images that appeared in the three "These Are The Voyages" books; to correct defects such as scratches and/or blemishes on the film scan - which I performed first on the color versions of the imagery, and also completed a preliminary color correction effort to remove the heavy magenta tinting affecting many of these photos before creating and then fine-tuning the black and white versions. 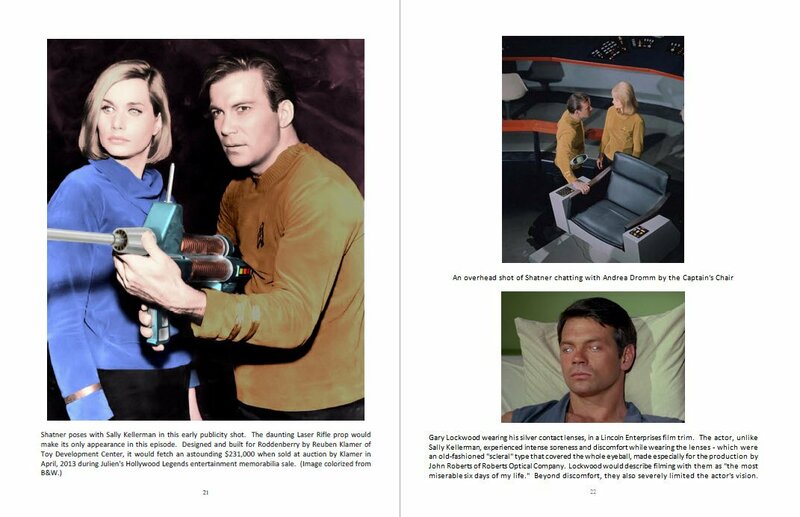 And throughout 2015 into the start of this year, I completed my final color correction efforts on all of the first season imagery - which typically involved selecting tiny portions of geometry within the individual photos and adjusting the colors one group of similar geometry at a time - such as all the actors skin, or all of the red velour Starfleet tunics, or just the red/orange railing in Bridge photos, etc. On a few occasions, the knowledge gained by the appearance of screen used TOS memorabilia at auction has enabled me to enhance the vintage imagery with unquestionably real world, historically accurate colors. 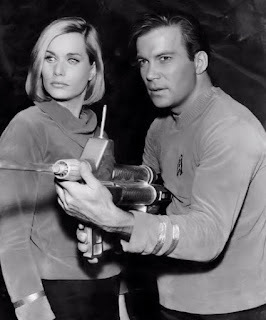 For example, modern day photos from the recent 2013 sale by Julien's Auctions in Los Angeles of Captain Kirk's Laser Rifle from the second pilot "Where No Man Has Gone Before" were very useful to my efforts to colorize an early B&W NBC publicity shot featuring Sally Kellerman and William Shatner, who posed with the laser rifle. 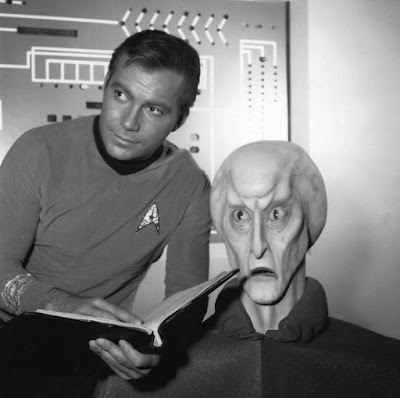 Here is what the original publicity photo looked like prior to colorization ... (Note: clicking on any picture below will display an enlarged version). 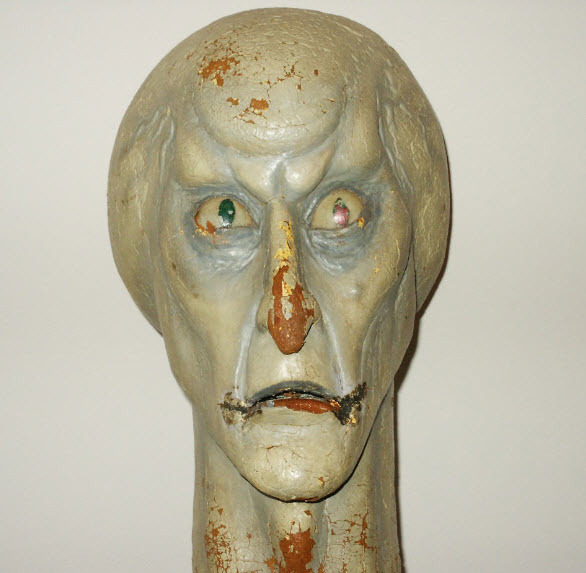 I believe that my photo restoration efforts have also been aided by the fact that, as a longtime Star Trek prop and costume collector, I have been quite fortunate over the years to have actually owned and/or handled dozens of screen used items from The Original Series, and so am familiar with their correct colors, and still possess items that have and will continue to serve as excellent color references. 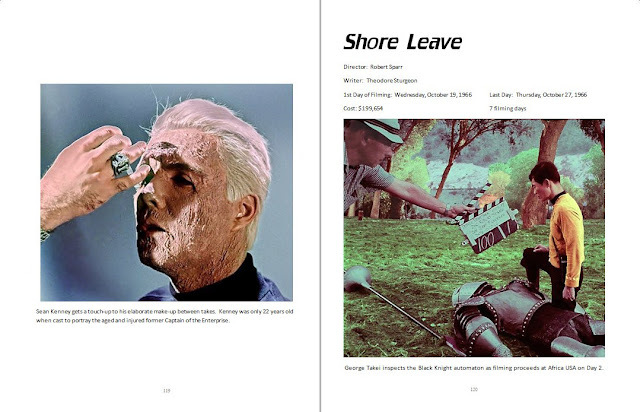 Although, it is certainly true that the appearance of some memorabilia, in particular the gold velour 1st and 2nd season command fabric as well as the olive-green nylon 3rd season command fabric used in the Starfleet tunics, could at times vary drastically under stage lighting or in flash photography, and thus not really closely resemble their natural, in-person and off-screen colors. 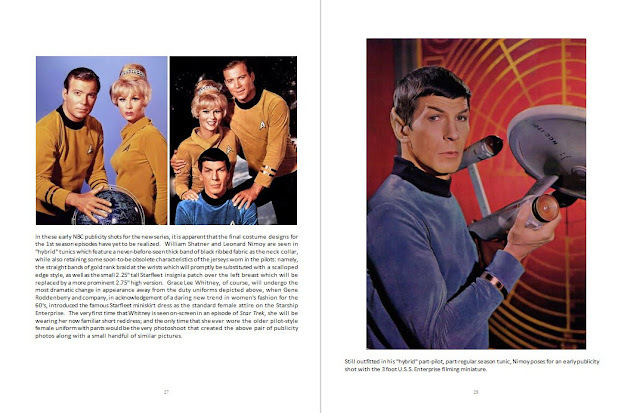 Still, it is my belief that the readers of this book will truly be able to enjoy some of the finest, historically accurate rare Star Trek photo restorations ever produced -- which are in some cases quite unique with regard to what has been seen in the past as I have especially created - for the first time ever to my knowledge - a number of brand new colorized versions of certain B&W candid and publicity shots just for inclusion in this volume. 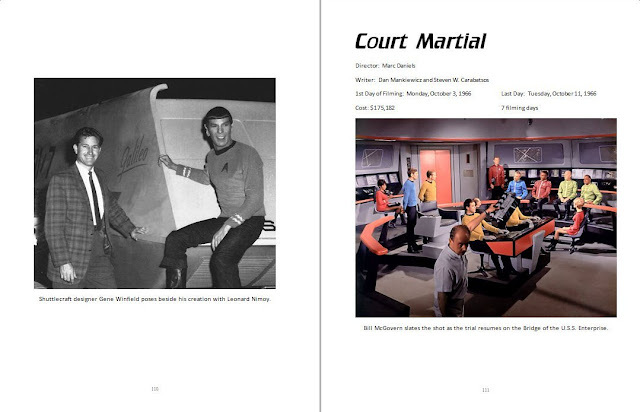 It should also be noted that the rare pictures in this collection are all accompanied by usually brief but, on occasion, quite extensive descriptions or anedotes about the filming of the related scene or episode. Which makes this volume, I believe, an entertaining and unique (and hopefully somewhat informative) photographic history of the making of the first season of TOS. 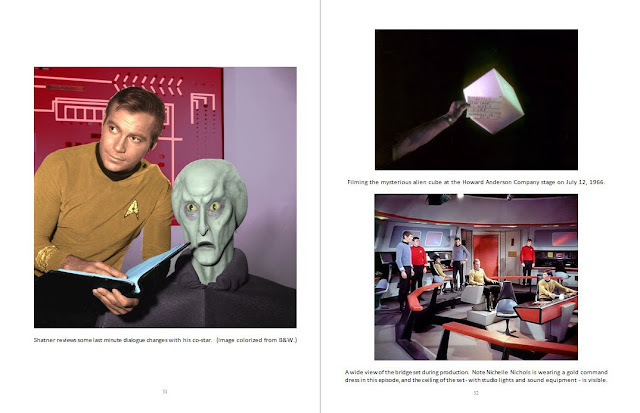 It is truly my hope that those fellow fans who decide to purchase a copy will be pleased to discover perhaps several previously unseen rare TOS images that will bring a smile to their faces; and that "To Boldly Go" will be a valued addition to their personal Star Trek libraries. Special thanks to my good friend and Saturn Award winning author Marc Cushman who has graciously given much of his time and knowledge in not only authoring the Foreword to this volume; but also in providing detailed editing notes and recommendations. "To Boldly Go - Rare Photos from the TOS Soundstage: Season One" will shortly appear on sale at Amazon.com (and indeed international Amazon websites) for its full list price of $40; but it is immediately available for purchase at the Createspace (an Amazon company) estore at the link provided below. As a special enticement for buyers to visit the Createspace store, I am pleased to provide the following introductory offer Discount Code which can only be used at Createspace and which allows you to buy "To Boldly Go" for just $36 (and thus realize a special 10% savings off the regular purchase price). 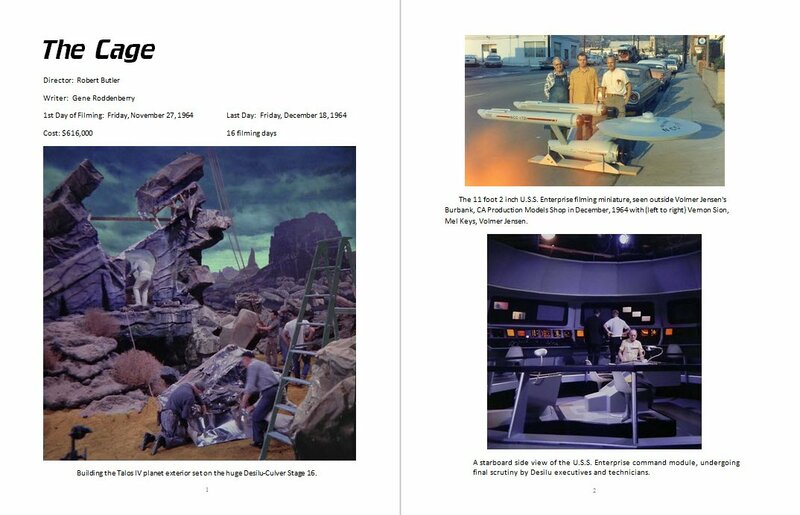 Interestingly, at $36 for 330 rare photos, the cost per image is close to 11 cents - which is slightly less than the 8 for $1 sales price of the Lincoln clips back in 1970.